02 Mar 2018 --- A research team has laid the foundation for a new method that could create probiotic fortified fruit snacks. 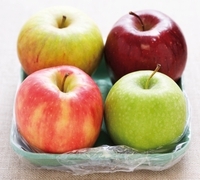 The technique – developed by researchers at the Universitat Politècnica de València and the Universidade Federal do Ceará – doses apple chunks with probiotic Lactobacillus casei and dries them at high temperatures. According to the researchers, enriching foods with probiotic strains can provide essential health benefits. “They contribute to reducing the risk of cardiovascular diseases and type 2 diabetes, they have anti-inflammatory potential and protect against colitis, among other benefits,” says Juan Andrés Cárcel, researcher of the Analysis and Simulation of Agri-food Processes Group at the Universitat Politècnica de València. In the study, researchers developed a mathematic model which could predict the drying kinetics and the inactivation of Lactobacillus casei in the fruit samples. It was found that combining the application of ultrasound with drying the samples at 60 and 10 degrees, resulted in a fruit sample that contained a high enough concentration of Lactobacillus to surpass the established probiotic food threshold. Probiotic products are usually located in the dairy aisles, yet there has been a growing number of applications of probiotics in food categories such as Baby & Toddler and Bakery. The strain used in the study, Lactobacillus casei, sits within the top ten probiotic strains that have seen an increase in use in the industry, as shown by Innova Market Insights data. Not only are probiotic products popular with consumers for their vast healthy-gut and nutritional benefits, but the entry of probiotic products into the dairy-free category is gaining ground. NutritionInsight has previously reported on the breakthrough line of dairy-free drinks made with the Califia Culture Blend. This research constitutes a first step in producing probiotic-fortified fruit snacks, a foray less explored by the F&B industry so far. There is a window of opportunity here for manufacturers to fortify products with probiotics in a far wider range of categories. Watch this space.